Preparing to abandon Baikonur, Roscosmos, Russia’s Federal Space Agency is knee deep in building their new spaceport, called the Vostochny Cosmodrome (Eastern Spaceport) in the Russian Far East. According to the plans, when completed, the Vostochny Cosmodrome is going to reduce Russia’s dependency on Kazakhstan, owner of the Baikonur Cosmodrome where the first man was launched to space. After several years of planning, re-planning and postponing, the new spaceport started to take shape this year at the new site in the Amur region. Roscosmos specialists recently completed the installation of the first set of equipment at the command post: the self-contained power supply system of the launch complex, now in test mode. They also started to assemble the freight unit for two rocket-carrying trains. The huge electro-hydraulic super-structure supporting the belt of the rockets on the launch pad before lift off is ready to standalone test as well, just as the 50-meter-tall, 1500-ton mobile service tower (check the blue-yellow and gray equipments in the photos below). The radar domes and dish antennas of the complex communication system seem to be completed. 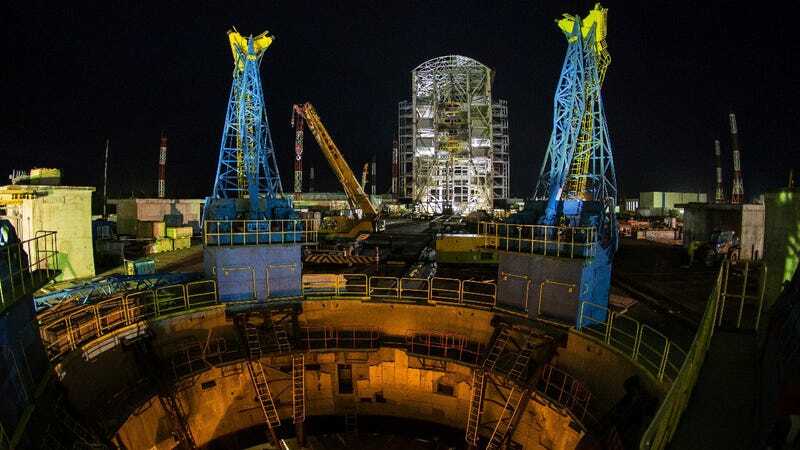 A total of seven launch pads will be built at the new cosmodrome, if everything goes well Soyuz-2 launches are going to begin at LD1 this year. The Russian space agency has been posting photos of the future launch site of their rockets on their Facebook, Flickr and VK pages for a while, the following images show how the construction works proceed.